Moving back and forth from Poland to Rego Park, New York, Maus tells two powerful stories: the first is Spiegelman’s father’s account of how he and his wife survived Hitler’s Europe, a harrowing tale filled with countless brushes with death, improbable escapes, and the terror of confinement and betrayal. The second is the author’s tortured relationship with his aging father as they try to lead a normal life of minor arguments and passing visits against a backdrop of history too large to pacify. At all levels, this is the ultimate survivor’s tale – and that, too, of the children who somehow survive even the survivors. Part I of Maus takes Spiegelman’s parents to the gates of Auschwitz and him to the edge of despair. Put aside all your preconceptions. These cats and mice are not Tom and Jerry, but something quite different. This is a new kind of literature. 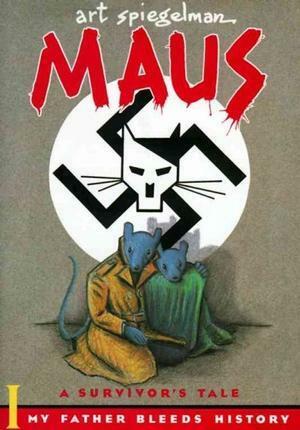 This year I really got into reading graphic novels extensively and had heard of Maus, but never had the chance to pick it up before I left for school. So, here at school I checked it out from the library and finally read it and I’m so glad I did! Even if you don’t like graphic novels or comics you should definitely try this out because the rich history and tragic storytelling give way to a beautiful composition. I love how the drawing and writing style of Art Spiegelman and how the Jews are portrayed as mice and the German’s cats. It makes it all the more nitty gritty and in some strange way puts more of a face to the whole disaster of this time period. With each page turn you are sucked further and further into the world of not only Nazi Germany, but also the world of the author and how he must retrieve this story from his father. I really liked how this aspect is shown because I think recording such stories is so important for history on a greater scale. I definitely can’t wait to read the second edition of this wonderful tale, and it’s taking all my effort to not run down to my library right now to pick it up!